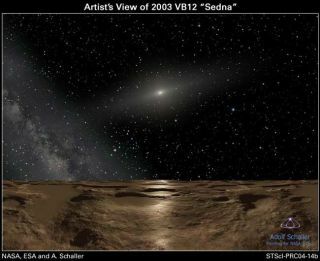 An artist rendering of the distant world Sedna, with the sun little more than a faraway star. A new study suggests Sedna may not be alone. An icy, unknown world might lurk in the distant reaches of our solar system beyond the orbit of Pluto, according to a new computer model. The hidden world -- thought to be much bigger than Pluto based on the model -- could explain unusual features of the Kuiper Belt, a region of space beyond Neptune littered with icy and rocky bodies. Its existence would satisfy the long-held hopes and hypotheses for a "Planet X" envisioned by scientists and sci-fi buffs alike. "Although the search for a distant planet in the solar system is old, it is far from over," said study team member Patryk Lykawka of Kobe University in Japan. The model, created by Lykawka and Kobe University colleague Tadashi Mukai, is detailed in a recent issue of Astrophysical Journal. If the new world is confirmed, it would not be technically a planet. Under a controversial new definition adopted by the International Astronomical Union (IAU) last week, it would instead be the largest known "plutoid." The Kuiper Belt contains many peculiar features that can't be explained by standard solar system models. One is the highly irregular orbits of some of the belt's members. The most famous is Sedna, a rocky object located three times farther from the sun than Pluto. Sedna takes 12,000 years to travel once around the Sun, and its orbit ranges from 80 to 100 astronomical units (AU). One AU is equal to the distance between the Earth and the Sun. According to the model, Sedna and other Kuiper Belt oddities could be explained by a world 30 to 70 percent as massive as Earth orbiting between 100 AU and 200 AU from the sun. At that distance, any water on the world's surface would be completely frozen. However, it might support a subsurface ocean like those suspected to exist on the moons Titan and Enceladus, said Mark Sykes, director of the Planetary Science Institute in Arizona. "The interesting thing for me is the suggestion of the kinds of very interesting objects that may yet await discovery in the outer solar system," said Sykes, who was not involved in the study. "We are still scratching the edges of that region of the solar system, and I expect many surprises await us with the future deeper surveys."